It’s summer’s biggest party as well as our nation’s proudest day. A time to enjoy our selves with friends, family and food to celebrate our country and make lasting summer memories. 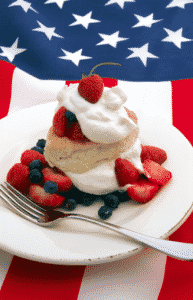 This year I decided to focus on appetizers and dessert recipe but be sure to find more Independence Day cooking inspiration with last year’s Patriotic Plates recipes as well as those from 2010, 2009 and 2008. May you enjoy your freedom to eat, drink and be merry! Combine the potatoes, 2 of the garlic cloves, the peppercorns and 1 teaspoon kosher salt in a medium pot. Cover with cold water and bring to a boil. Reduce the heat to a simmer and cook until the potatoes are just tender when pierced with a thin knife, 12 to 15 minutes. Drain and cool until still warm but no longer hot. Meanwhile, heat the oil in a medium skillet over medium-high heat. Slice the remaining 2 garlic cloves and add to the oil along with the bread pieces. Cook, stirring, until the bread is golden, about 3 minutes. Transfer to the bowl of a food processor and add the red peppers, vinegar, smoked paprika, tomatoes and 3/4 teaspoon kosher salt. Puree until smooth. Halve the warm potatoes and scoop out a small bit of the insides using a 1/4-teaspoon measure. Top the halves with a bit of the romesco sauce, sour cream, pine nuts and a sprinkle of parsley. Blend all ingredients in a blender until smooth and creamy. Then bring all ingredients to a boil in a medium saucepan. Pour into egg shaped candy or serving molds and refrigerate until set, about 30 minutes. Mini cupcake tins work well too for small, round molds. Once set, scoop out a well for the filling in each “egg” with a melon baller. Put all ingredients in food processor until well incorporated and smooth. Pipe the filling into the “egg” wells, dust with paprika and serve. Open the slits and brush the inside of each banana with melted butter, then sprinkle with sugar and 1 ounce chopped semisweet chocolate; fold up the foil. Grill the packets over high heat until the chocolate melts, 6 to 8 minutes (don’t worry if the peel turns brown). Open the peels and top the bananas with ice cream, whipped cream, sprinkles and a cherry. For the cake: Preheat the oven to 350 degrees F. Grease a 9-inch round cake pan with butter and dust with flour, tapping out the excess. Set aside. In a medium bowl, whisk together the flour, baking powder and salt. Beat the butter in a large bowl until fluffy, about 2 minutes. Add the sugar and continue to beat until very fluffy, about 2 minutes longer. In a small bowl, whisk the egg replacers and cream. Add half the flour mixture and half the egg mixture to the creamed butter and beat until combined. Repeat with the remaining flour and egg mixture. Add the lemon zest and vanilla and beat the batter on medium-high speed for an additional 1 to 2 minutes. Transfer the batter to the prepared cake pan, spread the top evenly and bake until a toothpick inserted into the center comes out clean and the top sprigs back to the touch, 40 to 45 minutes. Cool in the pan 10 minutes, and then turn out onto a wire rack and cool completely. While the cake bakes and cools, make the filling: Combine the rhubarb with the sugar and 1/4 cup water in a medium pot. Bring to a simmer over medium heat and continue to cook, stirring, until the rhubarb cooks down into a thick puree, 18 to 20 minutes. Cool completely, and then fold in half the strawberries. Stir the sugar into the remaining berries. For the whipped cream: When ready to assemble the cake, whip the cream with the sugar and vanilla until stiff peaks form. Using a serrated knife, slice the cake in half horizontally and place the bottom half on a cake stand or serving plate, cut-side up. Spread with 1 cup of the whipped cream, stopping about 1/2 inch from the edge of the cake and top with the strawberry-rhubarb mixture. Place the second half of the cake, cut-side down, over the strawberry-rhubarb filling and spread the remaining whipped cream over top, going close to the edge of the cake. Garnish with the remaining sliced strawberries.